Joe Biden's Advice On Compassion And Family, In His Own Words : It's All Politics "It's not all that difficult, folks, to be compassionate when you've been the beneficiary of compassion in your lowest moments," the vice president told Yale graduates in May. 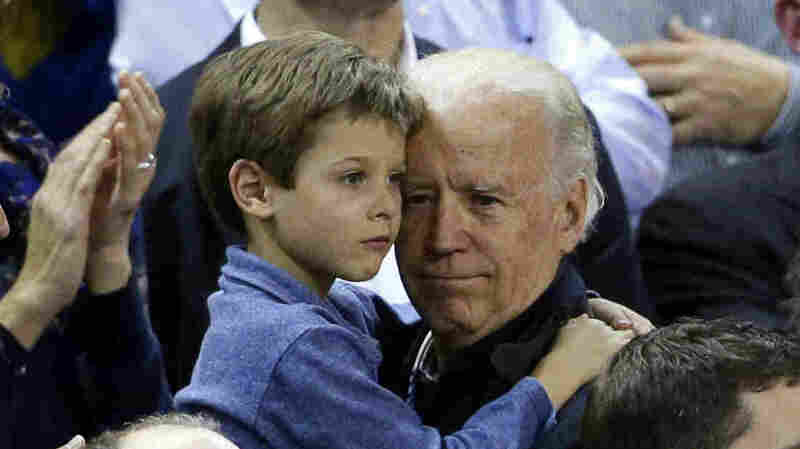 Vice President Joe Biden holds Beau Biden's son Hunter during a basketball game in 2013. Vice President Joe Biden's speech to Yale University graduates two weeks ago is taking on new meaning after his office announced Saturday that his son Beau died after battling brain cancer. In the May speech, highlighted Sunday by the Washington Post, Biden spoke about Beau, the importance of family, compassion and building real relationships with people who disagree with you. "It's not all that difficult, folks, to be compassionate when you've been the beneficiary of compassion in your lowest moments ... because when you know how much it meant to you, you know how much it mattered," Biden said. "It's not hard to be compassionate." The key to being successful and happy, he told graduates, is balancing ambition with perspective. "It's about being engaged," Biden said. "It's about being there for a friend or a colleague when they're injured or in an accident, remembering the birthdays, congratulating them on their marriage, celebrating the birth of their child. It's about being available to them when they're going through personal loss. It's about loving someone more than yourself." Speaking about an earlier car accident that claimed the life of his wife and infant daughter, and seriously injured Beau and his brother Hunter, Biden told graduates to keep in mind that "things can change in a heartbeat. I know." He said by focusing on his young sons during that time, "I found my redemption." "The incredible bond I have with my children is the gift I'm not sure I would have had, had I not been through what I went through," he said. Beau also spoke about his father being there for him after that fatal 1972 accident. He was introducing his father in 2008 at the Democratic National Convention, and said his dad was always at his side during that time, "My brother and I, not the Senate, were all that he cared about ... he said then Delaware can get another senator but my boys can't get another father." Jeremy and Kiki, the entire Class of 2015, congratulations and thank you for inviting me to be part of this special day. You're talented. You've worked hard, and you've earned this day. Mr. President, faculty, staff, it's an honor to be here with all of you. My wife teaches full-time. I want you to know that — at a community college, and has attended 8,640 commencements and/or the similar versions of Class Day, and I know they can hardly wait for the speaker to finish. (Laughter.) But I'll do my best as quickly as I can. Now, look, I realize no one ever doubts I mean what I say, the problem occasionally is I say all that I mean. (Laughter.) I have a bad reputation for being straight. Sometimes an inappropriate times. (Laughter.) So here it goes. Let's get a couple things straight right off the bat: Corvettes are better than Porsches; they're quicker and they corner as well. (Laughter and applause.) And sorry, guys, a cappella is not better than rock and roll. (Laughter and applause.) And your pundits are better than Washington pundits, although I've noticed neither has any shame at all. (Laughter and applause.) And all roads lead to Toads? Give me a break. (Laughter and applause.) You ever tried it on Monday night? (Laughter.) Look, it's tough to end a great men's basketball and football season. One touchdown away from beating Harvard this year for the first time since 2006 — so close to something you've wanted for eight years. I can only imagine how you feel. (Laughter.) I can only imagine. (Applause.) So close. So close. By the way, I've had a lot of law graduates from Yale work for me. That's not too far from the truth. But anyway, look, the truth of the matter is that I have a lot of staff that are Yale graduates, several are with me today. They thought it was a great idea that I speak here. As a matter of fact, my former national security advisor, Jake Sullivan, who is teaching here at Yale Law School, trained in international relations at Yale College, edited the Yale Daily News, and graduated from Harvard — excuse me, Freudian slip — Yale Law School. (Laughter.) You're lucky to have him. He's a brilliant and decent and honorable man. And I miss him. And we miss him as my national security advisor. Look, at a Gridiron Dinner not long ago, the President said, I — the President — "I am learning to speak without a teleprompter, Joe is learning to speak with one." (Laughter.) But if you looked at my speechwriters, you know why. And the granddaughter of one of my dearest friends in life — a former Holocaust survivor, a former foreign policy advisor, a former Chairman of the House Committee on Foreign Affairs, Congressman Tom Lantos — is graduating today. Mercina, congratulations, kiddo. (Applause.) Where are you? You are the sixth — she's the sixth sibling in her immediate family to graduate from Yale. Six out of 11, that's not a bad batting average. (Laughter.) I believe it's a modern day record for the number of kids who went to Yale from a single family. And her grandmother, Annette, is also a Holocaust survivor, an amazing woman; and both I'm sure wherever they are, beaming today. And I know one more thing, Mercina, your father and grandfather are looking down, cheering you on. Look, I don't know about that. But I'm just glad there's someone — just someone — who dreams of being Vice President. (Laughter and applause.) Just somebody. I never had that dream. (Laughter.) For the press out there, that's a joke. But with the rest let me say upfront, and I mean this sincerely, there's nothing particularly unique about me. With regard to resilience and compassion, there are countless thousands of people, maybe some in the audience, who've suffered through personal losses similar to mine or much worse with much less support to help them get through it and much less reason to want to get through it. It's not all that difficult, folks, to be compassionate when you've been the beneficiary of compassion in your lowest moments not only from your family, but from your friends and total strangers. Because when you know how much it meant to you, you know how much it mattered. It's not hard to be compassionate. And a father who lived his motto that, family was the beginning, the middle, and the end. And like many of you and your parents, I was fortunate. I learned early on what I wanted to do, what fulfilled me the most, what made me happy — my family, my faith, and being engaged in the public affairs that gripped my generation and being inspired by a young President named Kennedy — civil rights, the environment, trying to end an incredibly useless and divisive war, Vietnam. You each have different comfort levels. Everyone has different goals and aspirations. But one thing I've observed, one thing I know, an expression my dad would use often, is real. He used to say, it's a lucky man or woman gets up in the morning — and I mean this sincerely. It was one of his expressions. It's a lucky man or woman gets up in the morning, puts both feet on the floor, knows what they're about to do, and thinks it still matters. I've been lucky. And my wish for all of you is that not only tomorrow, but 20 and 40 and 50 years from now, you've found that sweet spot, that thing that allows you to get up in the morning, put both feet on the floor, go out and pursue what you love, and think it still matters. Some of you will go to Silicon Valley and make great contributions to empower individuals and societies and maybe even design a life-changing app, like how to unsubscribe to Obama for America email list — (laughter) — the biggest "pan-list" of all times. I've met an awful lot of people in my career. And I've noticed one thing, those who are the most successful and the happiest — whether they're working on Wall Street or Main Street, as a doctor or nurse, or as a lawyer, or a social worker, I've made certain basic observation about the ones who from my observation wherever they were in the world were able to find that sweet spot between success and happiness. Those who balance life and career, who find purpose and fulfillment, and where ambition leads them. There's no silver bullet, no single formula, no reductive list. But they all seem to understand that happiness and success result from an accumulation of thousands of little things built on character, all of which have certain common features in my observation. First, the most successful and happiest people I've known understand that a good life at its core is about being personal. It's about being engaged. It's about being there for a friend or a colleague when they're injured or in an accident, remembering the birthdays, congratulating them on their marriage, celebrating the birth of their child. It's about being available to them when they're going through personal loss. It's about loving someone more than yourself, as one of your speakers have already mentioned. It all seems to get down to being personal. When I walked into Mansfield's office, I must have looked as angry as I was. He was in his late 70s, lived to be 100. And he looked at me, he said, what's bothering you, Joe? I said, that guy, Helms, he has no social redeeming value. He doesn't care — I really mean it — I was angry. He doesn't care about people in need. He has a disregard for the disabled. It happened early in my career fortunately. From that moment on, I tried to look past the caricatures of my colleagues and try to see the whole person. Never once have I questioned another man's or woman's motive. And something started to change. If you notice, every time there's a crisis in the Congress the last eight years, I get sent to the Hill to deal with it. It's because every one of those men and women up there — whether they like me or not — know that I don't judge them for what I think they're thinking. All of which he opposed — from paying tens of millions of dollars in arrearages to an institution, he despised, the United Nations — he was part of the so-called "black helicopter" crowd; to passing the chemical weapons treaty, constantly referring to, "we've never lost a war, and we've never won a treaty," which he vehemently opposed. But we were able to do these things not because he changed his mind, but because in this new relationship to maintain it is required to play fair, to be straight. The cheap shots ended. And the chicanery to keep from having to being able to vote ended — even though he knew I had the votes. So one piece of advice is try to look beyond the caricature of the person with whom you have to work. Resist the temptation to ascribe motive, because you really don't know -— and it gets in the way of being able to reach a consensus on things that matter to you and to many other people. Build real relationships — even with people with whom you vehemently disagree. You'll not only be happier. You will be more successful. The second thing I've noticed is that although you know no one is better than you, every other persons is equal to you and deserves to be treated with dignity and respect. I've worked with eight Presidents, hundreds of Senators. I've met every major world leader literally in the last 40 years. And I've had scores of talented people work for me. And here's what I've observed: Regardless of their academic or social backgrounds, those who had the most success and who were most respected and therefore able to get the most done were the ones who never confused academic credentials and societal sophistication with gravitas and judgment. Don't forget about what doesn't come from this prestigious diploma — the heart to know what's meaningful and what's ephemeral; and the head to know the difference between knowledge and judgment. But even if you get these things right, I've observed that most people who are successful and happy remembered a third thing: Reality has a way of intruding. I got elected in a very improbable year. Richard Nixon won my state overwhelmingly. George McGovern was at the top of the ticket. I got elected as the second-youngest man in the history of the United States to be elected, the stuff that provides and fuels raw ambition. And if you're not careful, it fuels a sense of inevitability that seeps in. But be careful. Things can change in a heartbeat. I know. And so do many of your parents. Six weeks after my election, my whole world was altered forever. While I was in Washington hiring staff, I got a phone call. My wife and three children were Christmas shopping, a tractor trailer broadsided them and killed my wife and killed my daughter. And they weren't sure that my sons would live. The incredible bond I have with my children is the gift I'm not sure I would have had, had I not been through what I went through. Who knows whether I would have been able to appreciate at that moment in my life, the heady moment in my life, what my first obligation was. So I began to commute — never intending to stay in Washington. And that's the God's truth. I was supposed to be sworn in with everyone else that year in '73, but I wouldn't go down. So Mansfield thought I'd change my mind and not come, and he sent up the secretary of the Senate to swear me in, in the hospital room with my children. And I began to commute thinking I was only going to stay a little while — four hours a day, every day — from Washington to Wilmington, which I've done for over 37 years. I did it because I wanted to be able to kiss them goodnight and kiss them in the morning the next day. No, "Ozzie and Harriet" breakfast or great familial thing, just climb in bed with them. Because I came to realize that a child can hold an important thought, something they want to say to their mom and dad, maybe for 12 or 24 hours, and then it's gone. And when it's gone, it's gone. And it all adds up. But looking back on it, the truth be told, the real reason I went home every night was that I needed my children more than they needed me. Some at the time wrote and suggested that Biden can't be a serious national figure. If he was, he'd stay in Washington more, attend to more important events. It's obvious he's not serious. He goes home after the last vote. But I realized I didn't miss a thing. Ambition is really important. You need it. And I certainly have never lacked in having ambition. But ambition without perspective can be a killer. I know a lot of you already understand this. Some of you really had to struggle to get here. And some of you have had to struggle to stay here. And some of your families made enormous sacrifices for this great privilege. And many of you faced your own crises, some unimaginable. But the truth is all of you will go through something like this. You'll wrestle with these kinds of choices every day. But I'm here to tell you, you can find the balance between ambition and happiness, what will make you really feel fulfilled. And along the way, it helps a great deal if you can resist the temptation to rationalize. My chief of staff for over 25 years, one of the finest men I've ever known, even though he graduated from Penn, and subsequently became a senator from the state of Delaware, Senator Ted Kaufman, every new hire, that we'd hire, the last thing he'd tell them was, and remember never underestimate the ability of the human mind to rationalize. Never underestimate the ability of the human mind to rationalize — her birthday really doesn't matter that much to her, and this business trip is just a great opportunity; this won't be his last game, and besides, I'd have to take the redeye to get back. We can always take this family vacation another time. There's plenty of time. For your generation, there's an incredible amount of pressure on all of you to succeed, particularly now that you have accomplished so much. You're whole generation faces this pressure. I see it in my grandchildren who are honors students at other Ivy universities right now. You race to do what others think is right in high school. You raced through the bloodsport of college admissions. You raced through Yale for the next big thing. And all along, some of you compare yourself to the success of your peers on Facebook, Instagram, Linked-In, Twitter. But resist that temptation to rationalize what others view is the right choice for you -— instead of what you feel in your gut is the right choice —- that's your North Star. Trust it. Follow it. You're an incredible group of young women and men. And that's not hyperbole. You're an incredible group. And as your parents will understand, my dad's definition of success is when you look at your son and daughter and realize they turned out better than you, and they did. But you'll have opportunities. Make the most of them and follow your heart. You have the intellectual horsepower to make things better in the world around you. Here's something else I observed — intellectual horsepower and tolerance alone does not make a generation great: unless you can break out of the bubble of your own making — technologically, geographically, racially, and socioeconomically — to truly connect with the world around you. Because it matters. No matter what your material success or personal circumstance, it matters. You can't breathe fresh air or protect your children from a changing climate no matter what you make. If your sister is the victim of domestic violence, you are violated. If your brother can't marry the man he loves, you are lessened. And if your best friend has to worry about being racially profiled, you live in a circumstance not worthy of us. (Applause.) It matters. So be successful. I sincerely hope some of you become millionaires and billionaires. I mean that. But engage the world around you because you will be more successful and happier. And you can absolutely succeed in life without sacrificing your ideals or your commitments to others and family. I'm confident that you can do that, and I'm confident that this generation will do it more than any other. Look to your left, as they say, and look to your right. And remember how foolish the people next to you look — (laughter) — in those ridiculous hats. (Laughter.) That's what I want you to remember. I mean this. Because it means you've learned something from a great tradition. It means you're willing to look foolish, you're willing to run the risk of looking foolish in the service of what matters to you. And if you remember that, because some of the things your heart will tell you to do, will make you among your peers look foolish, or not smart, or not sophisticated. But we'll all be better for people of your consequence to do it. That's what I want you to most remember. Not who spoke at the day you all assembled on this mall. You're a remarkable class. I sure don't remember who the hell was my commencement speaker. (Laughter.) I know this is not officially commencement. But ask your parents when you leave here, who spoke at your commencement? It's a commencement speaker aversion of a commencement speaker's fate to be forgotten. The question is only how quickly. But you're the best in your generation. And that is not hyperbole. And you're part of a remarkable generation. And, you — you're on the cusp of some of the most astonishing breakthroughs in the history of mankind — scientific, technological, socially — that's going to change the way you live and the whole world works. But it will be up to you in this changing world to translate those unprecedented capabilities into a greater measure of happiness and meaning — not just for yourself, but for the world around you. And I feel more confident for my children and grandchildren knowing that the men and women who graduate here today, here and across the country, will be in their midst. That's the honest truth. That's the God's truth. That's my word as a Biden.